I love taking monthly photos of my sweet babies. But what do you do with them? Are you like me and they just sit in your camera or maybe on social media. Why did you take all those cute pictures if you aren't going to use them and display them? Instead, why not make a sweet baby photo keepsake. One simple and easy keepsake ideas is to make a collage. 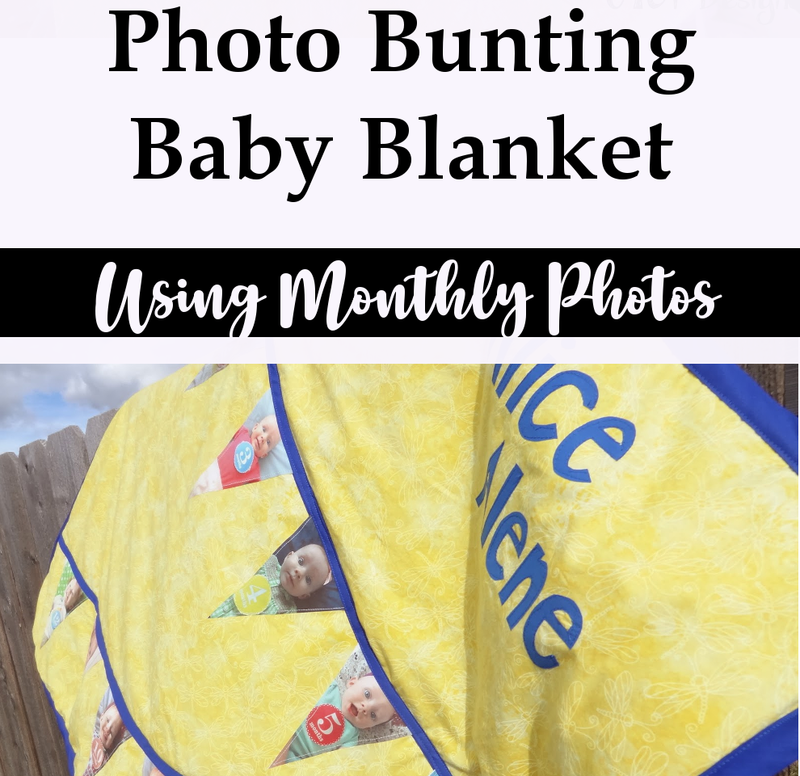 Take all those cute month photos and you can use a website like Shutterfly to create a collage. I love to see the photos side by side and see the changes each month. If you want to get some sewing in make a sweet Budding Baby Bunting Blanket. The great thing about this blanket is that it doesn't take a ton of work and you don't have to be an amazing quilter to make one yourself. 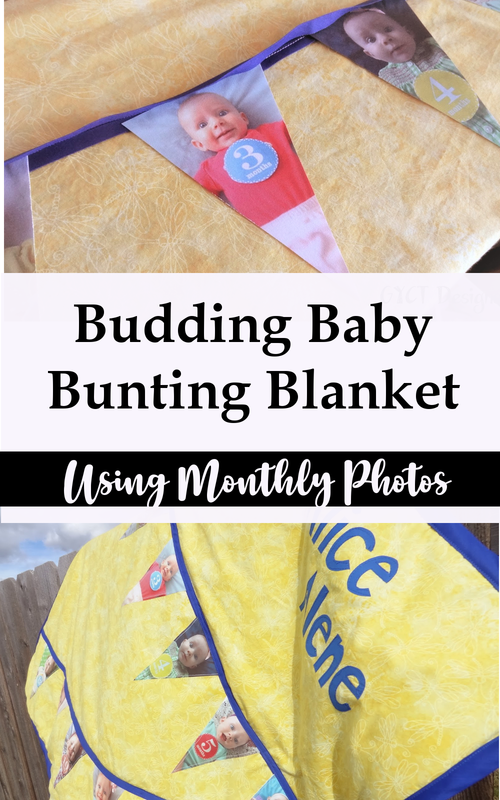 First, you'll need to make bunting out of your baby's monthly pictures. I set mine up so that I could print 4 of them to a page. You can decide how big you want to make them. Follow the instructions on your Fusible Fabric package for printing. It is super easy. Decide how you want your bunting to lay on the fabric. Take your double fold bias tape and lay it out on your main fabric. I just did two rows, but you could do 3 or even 4. The rows will depend on the size of your bunting pictures as well. Experiment a little before you commit. Then pin it in place. Open the bias tape and stitch it down to the fabric. Now grab those cute bunting pictures. Iron them in between the bias tape and then to the fabric. Make sure to follow the instructions on the packaging so you don't ruin them. Once the pictures are ironed on, stitch them down. Make sure the stitching is close to the outside edge. Once all the pictures are sewn down, fold your bias tape down and stitch across the bias tape to close it. Stitch along the bottom edge of the bias tape. I cut out my daughter's name to stitch to the blanket. You could add your child's name, birthday, other pictures. (Using the Cricut Maker or Silhouette Cameo 3 would work great for cutting out fabric pieces.) Whatever you want. I cut out her name and then stitched it on. Your blanket should look something like the picture below. Now place your batting and remaining yard of fabric underneath your bunting layer. Make sure Right Sides are facing out. Pin all the layers together really well. Once your pinned, stitch along the top edge of your bunting bias tape. You can see below. This will keep your batting from moving around. Now all you have to do is bind your blanket. Grab your quilting bias tape. Open it up and stitch it to the edge of your blanket through all the layers. You can see that below. Then fold the bias tape around to the opposite side and stitch it in place. Go hang it on the crib, the wall, or hand it to your baby so they can carry it around the house and slobber on it (not saying that is what happened at my house! Wink, wink). Need some more baby projects to do? Check out our round-up for 15 free baby tutorials.